Is there a way to add some kind of drainage to a low spot in our lawn, right beside a patio and a sidewalk. We cannot build up the area so it would have to be underground I think. It is always puddled after the rain and it was very icy in the winter. In the photo it is the area right beside the sidewalk. Thank you for contacting Toronto Master Gardeners with your enquiry about improving drainage in your yard. The first thing to consider is the source of the pooling water. Is it collecting in a low lying area just from precipitation, or is the water accumulating from another source near the house? We will address the pooling water on your lawn. It is possible to intentionally contour a lawn so that water flows into drains or ponds instead of creating wet and muddy areas in the grass. 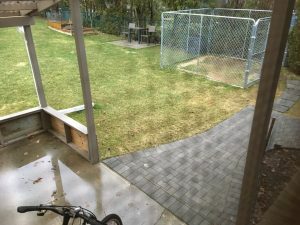 The article here:https://homeguides.sfgate.com/fix-wet-areas-lawn-25112.html How to Fix Wet Areas in the Lawn recommends French drains to control the flow of water on a sloped lawn. French drains are subsurface, gravel-filled drains that allow the gardener to direct the way water flows across a landscape and the method is fully described there. The article provides a step-by-step guide to this do-it-yourself project as well as a list of the items needed for the task. Contact the local utilities so someone can mark where buried lines are on your property. If there are utility lines buried under where you plan to add drainage tile, change your tile layout accordingly. We wish you every success in clearing up this sticky problem.